Barry received a Humboldt Prize Fellowship to work at the Commission for Glaciology at the Bavarian Academy of Sciences in Munich from May through October 2009 and August-October 2010. He prepared (with Thian Gan, University of Edmonton) a new book on the cryosphere for Cambridge University Press during this time. The book "The global cryosphere, past, present and future" is in production and will be published in June 2011. 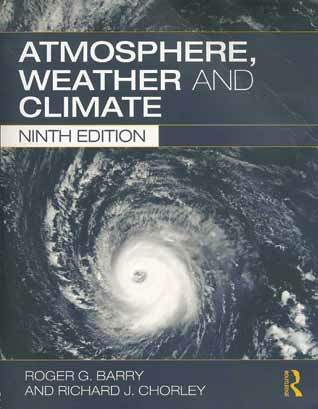 I completed and published the ninth edition of Atmosphere, Weather and Climate (Barry, R.G. and R.J. Chorley (deceased), Routledge, London, 516 pp.). First published in 1968, the work is a comprehensive introductory textbook that has been updated to reflect recent advances. Following an introductory overview of the historical development of the field, there is an extended treatment of atmospheric composition and energy, stressing the heat budget of the Earth and the causes of the greenhouse effect. Then it turns to the manifestations and circulation of atmospheric moisture, including atmospheric stability and precipitation patterns in space and time. A consideration of atmospheric and oceanic motion on small to large scales leads on to a new chapter on modeling of the atmospheric circulation and climate, which also presents weather forecasting on different time scales. This chapter was prepared by CIRES Fellow Tom Chase. It is followed by a discussion of the structure of air masses, the development of frontal and non-frontal cyclones, and development of mesoscale convective systems in mid-latitudes. The treatment of weather and climate in temperate latitudes begins with studies of Europe and America, extending to the conditions of their subtropical and high-latitude margins and includes the Mediterranean, Australasia, North Africa, the southern westerlies, and the sub-Arctic and polar regions. Tropical weather and climate are also described through an analysis of the climatic mechanisms of monsoon Asia, Africa, Australia, and Amazonia, together with the tropical margins of Africa and Australia and the effects of ocean movement and the El Niño–Southern Oscillation and teleconnections. Smallscale climates—including urban climates—are considered from the perspective of energy budgets. The final chapter, revised by CIRES Fellow Mark Serreze, stresses the structure and operation of the atmosphere–Earth–ocean system and the causes of its climate changes. Since the previous edition was released in 2003, the pace of research on the climate system and attention to global climate change has accelerated and the 2007 Intergovernmental Panel on Climate Change report has been published. A consideration of other environmental impacts of climate change is included. Apart from the two new chapters, all figures have been redrawn in color. During May-October 2009, I was supported by an award from the Humboldt Foundation of Germany at the Kommission fuer Glaziologie of the Bavarian Academy of Sciences in Munich. During the first month, I prepared the index for Atmosphere, Weather and Climate. I then began preparing a text, The Cryosphere: Past, Present, and Future with Thian Gan of the University of Edmonton. The work, which is under contract to Cambridge University Press, is continuing, and I will return to Munich during August- October 2010.